Put simply, Invisalign is orthodontics without metal braces! Adults and teens who want to resolve crowding and close unwanted spaces between teeth can utilize this program to achieve a straighter, healthier smile in as little as few months. Every patient presents with unique obstacles and challenges, which makes placing a uniform timeline on Invisalign treatment difficult. However, we have found that the vast majority of cases are completed in 6-9 months. 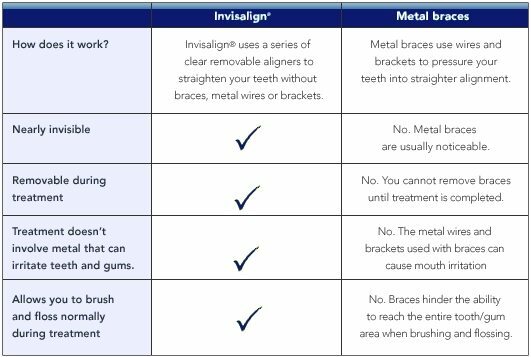 What is the Difference Between Invisalign and Metal Braces? Your consultation appointment will involve a set of digital photos and a digital scan of your teeth using our iTero technology. This scan will then allow the doctor and the patient to review a simulated outcome of treatment, and allows the patient to communicate their desires to the doctor. Once a plan has been established and the trays have been fabricated by Invisalign, you will return to the office to begin treatment. This appointment involves placing small, tooth colored buttons on select teeth which will aid in the movement of your teeth. In addition, we may wish to contour select teeth to create appropriate space for teeth to move. You return periodically throughout the course of treatment to allow our doctors to track the progress of your tooth movement, answer any questions you may have, and give you your next sequence of Invisalign trays. At the conclusion of treatment, all of the tooth colored buttons are removed and your teeth are cosmetically re-shaped to remove any existing chips or imperfections that you desire to be removed. At this appointment, you will also be digitally scanned for your retainers, which you will wear at night.